Toward the latter part of the 1980s, Cocktail Big and Die Hard were in the movie theaters, George Michael was telling us to have “Faith” and Wahoo’s Fish Tacos opened its first location in Costa Mesa, California. On the wall in that restaurant, was one of the first chemical warning signs posted because of Prop 65. Proposition 65, or the Safe Drinking Water and Toxic Enforcement Act of 1986 as it is officially known, is a “right to know” law (rather than a pure product safety law) passed by California voters requiring businesses with 10 or more employees to provide warnings of exposure to chemicals known to cause cancer or reproductive toxicity. Allowing consumers, the choice to expose themselves to the specific risk in the warning. WARNING: Chemicals known to the State of California to cause cancer, or birth defects or other reproductive harm may be present in foods or beverages sold or served here. WARNING: Certain foods and beverages sold or served here can expose you to chemicals including acrylamide in many fried or baked foods, and mercury in fish, which are known to the State of California to cause cancer and birth defects or other reproductive harm. 1. Adding the name of one listed chemical that prompted the warning, tailored to specific use cases. 2. The internet address for OEHHA’s new Prop 65 warning information website. 4. Provides for website warnings for products purchased over the internet. Remember: You only have until August 30, 2018 to post your new warning signs. 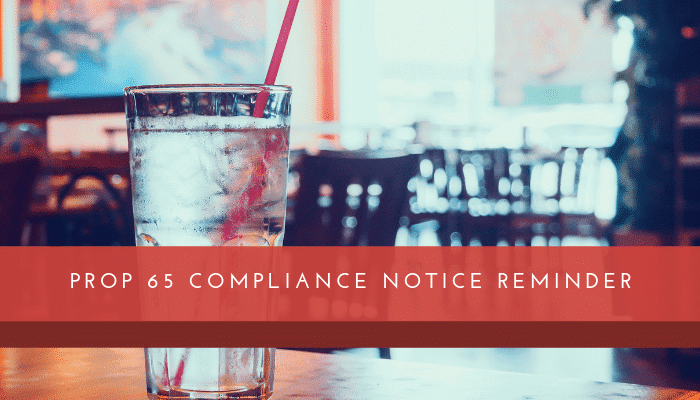 There are very specific sign requirements (see below) and fines associated with non-compliance, so it is not recommended that restaurateurs attempt to make their own sign. B)	Be provided in a conspicuous manner and under such conditions as to make it likely to be seen, read and understood by any ordinary individual in the course of normal daily activity. C)	Be provided in English and any other language used on other signage in the affected area. Preprinted signs are available online, just search “new prop 65 restaurant signs” or visit P65Warnings.ca.gov/restaurant. If you have questions regarding requirements. We at KROST have been helping restaurant owners and operators grow their businesses and become more profitable for nearly 80 years. Please contact Robert A. Benson (robert.benson@krostcpas.com) if would like to schedule a complimentary one-hour consultation for your restaurant.